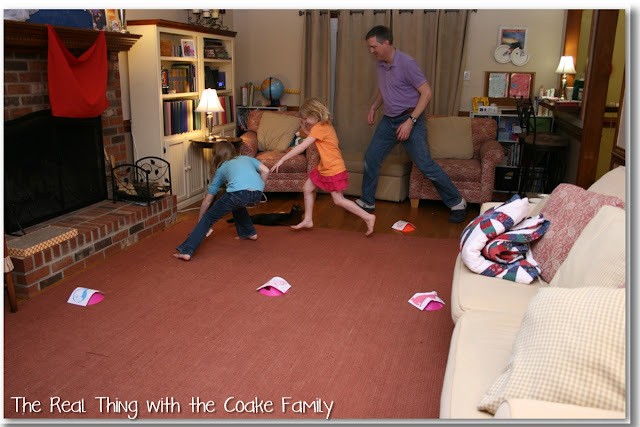 I have another in my series of activities for the family for you today. 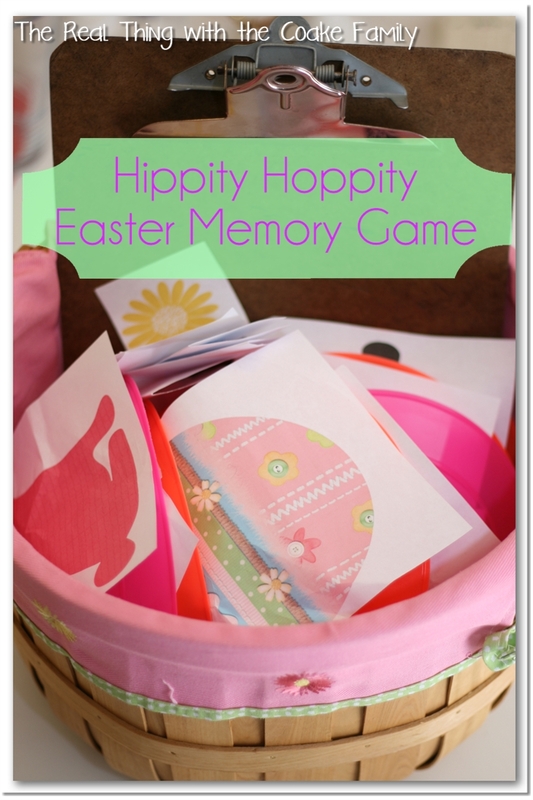 This month I came up with an Easter themed memory game for you and your family to play. This game will work for any age. The way we played the game will work a little better for older kids (5+) but you could easily modify the game for younger kids. This is an active game…Yay! 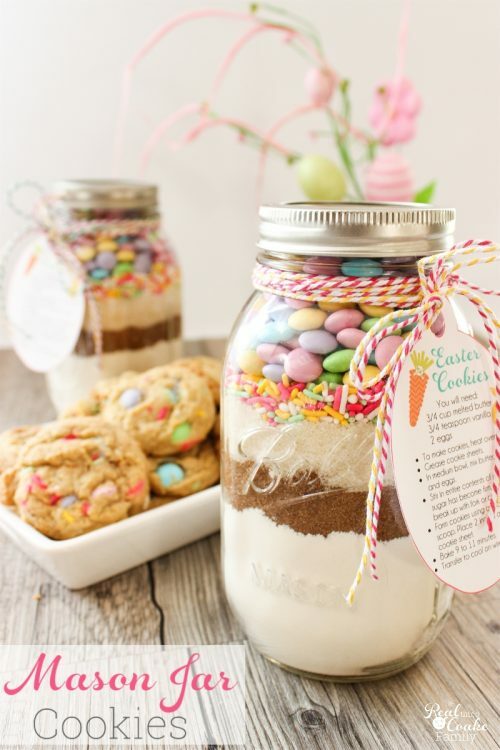 Something to burn off that excess energy or Easter candy if you were to play in on Easter! Print off Easter pictures. You could use clip art pictures or search Google for pictures. You will want two of each picture. I made one of each picture that was a half sheet of paper(for the cones) and one that was 1/8 of a sheet of paper(for the caller cards). If you are using cones (mine are from the dollar spot at Target) that are the same size and shape as mine, tape the picture over the top of the cone. I used doughnut holes of tape to secure the pictures to the cones. If you have taller cones, you can tape the pictures to one side of the cone. We used this as an Easter themed game, but you could easily modify it for any event or use numbers for everyday fun. I modified this idea from Family Fun March 2013 magazine. They used numbers in their version, but I wanted an Easter game so I modified it a little bit. Their version was also designed for only two players. I modified it for the whole family to play. Set up the game by placing your cones (or pictures/ bags) around the space you are using for the game and marking a start line. This would be a fantastic outdoor game, but as it was dark and cold, we decided to play inside. 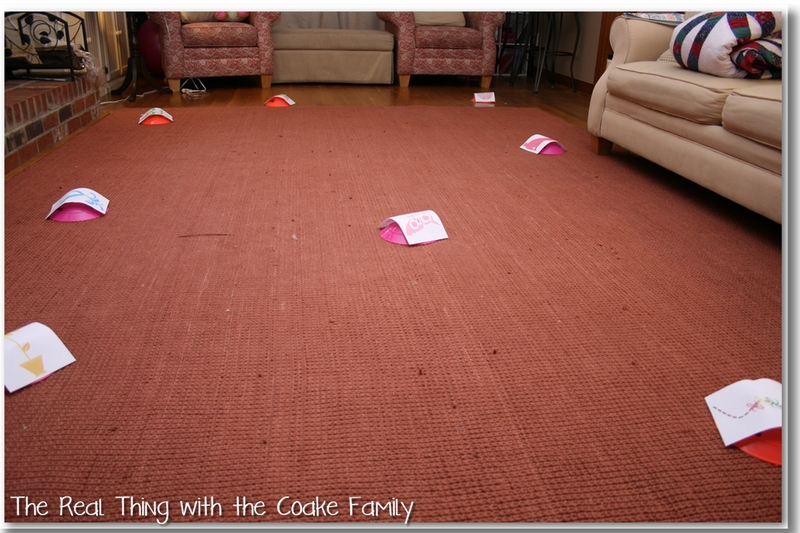 Please pardon my old rug that looks threadbare in these pictures. 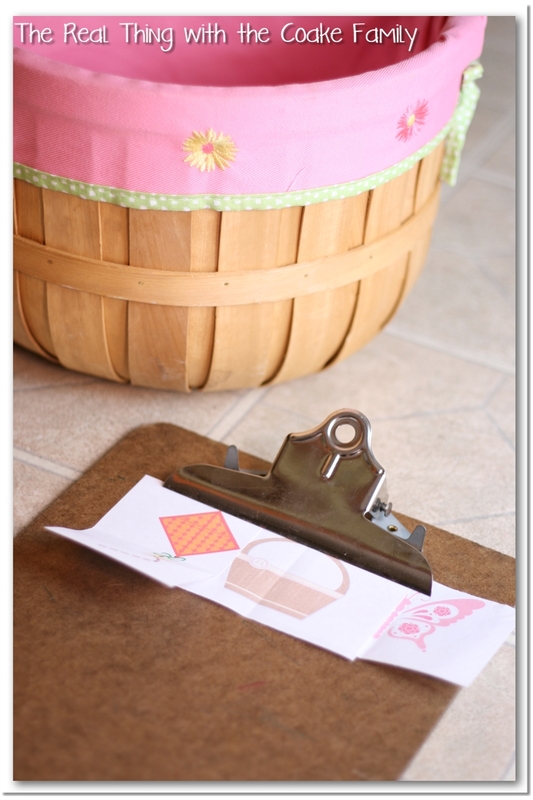 An Easter basket and clipboard are not required for this game, but they helped us with our game. Choose a caller for your first game. The rest of the family will stand behind your start line. The caller picks a picture from the basket and calls out that picture. The rest of the family runs to the picture, touches it and runs back to the start line. The caller will then pick another picture from the basket and call out the first picture then this second picture. The family wait until all of the pictures have been called, then run to the first picture, touch it, run to the second picture, touch it, and run back to the start line. Play continues in this manner until you have reached 5 pictures. 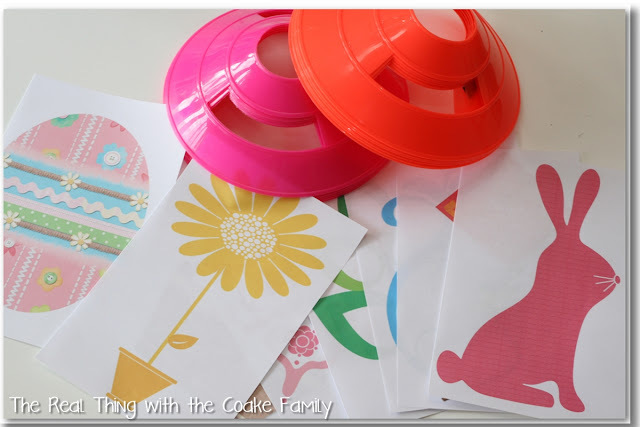 For a family with older kids, you could easily add more than 5 pictures or you could make the game more challenging by not repeating the names of the other pictures already drawn and only calling out the new picture. 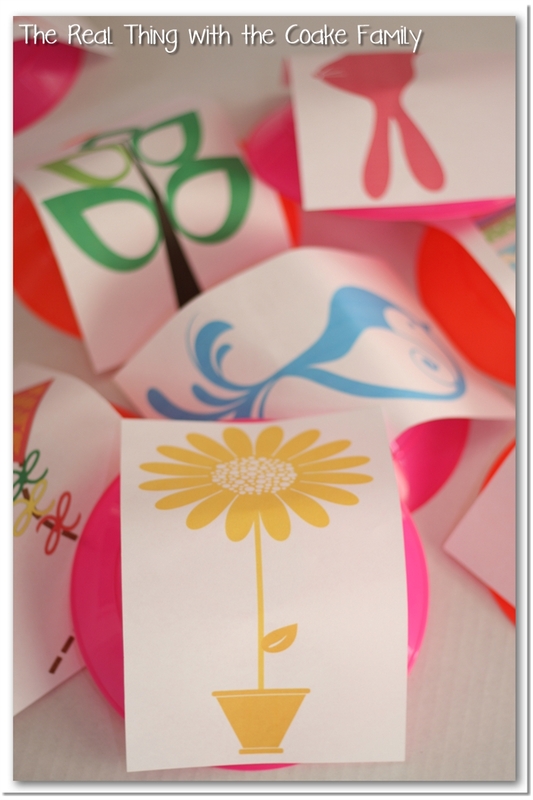 If you are playing with younger kids, just reduce the number of pictures to what works for their memory skills. We used the clipboard as a way to place the picture in the order they were called. That way there would be no confusion as to which picture had been called in in which order. We did that by picking a card and placing it on the clipboard. Once another pictures was drawn, it went on the clipboard behind the first picture and so on until all 5 pictures had been drawn. Once again, you can see that the cat we adopted a few months ago, fits right in. In the picture above, he is just lounging in the middle of the game space as though 3 people aren't about to run right into him! We did not play our game competitively. As I have mentioned before, we have a 5 year age difference between our girls. 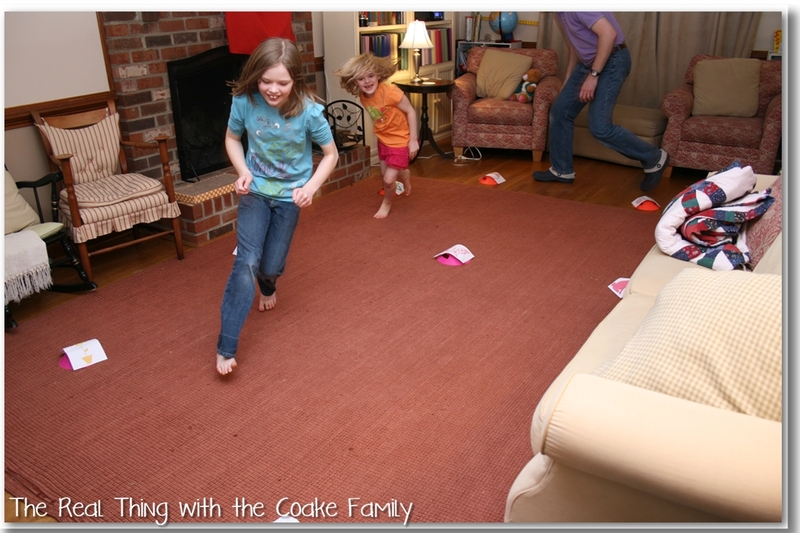 When we play competitively at games like this, our youngest child feels badly that she can't keep up. I don't want our family time to cause that, so we just played for fun. Of course, we teased each other about, “I'm going to beat you,” and such and so on. It was all in fun and no one got hurt feelings. We did have a few hands and toes that got stepped on though and one body check that I got a great picture of…evidence against the offending child. That ended her turn for that round and earned her a time out. We tried a few rounds hopping like bunnies. The kids liked that one because, apparently, I am very slow at hopping (not true of my running) and they beat me every time we played the hopping version. 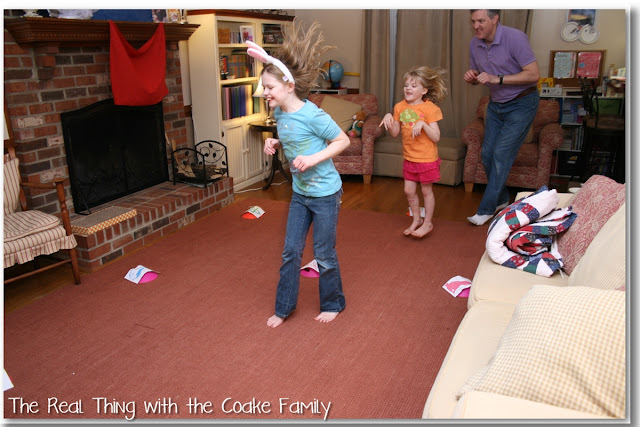 All in all, our silly, wacky family had a fun family night playing this hippity hoppity Easter memory game. The Easter basket with all the supplies has even been left out in our living room and the girls have played again a few times. In the 2 person version, one person is the caller while the other is the runner. Once the runner has done his/her 5 turns, the caller and runner switch roles. 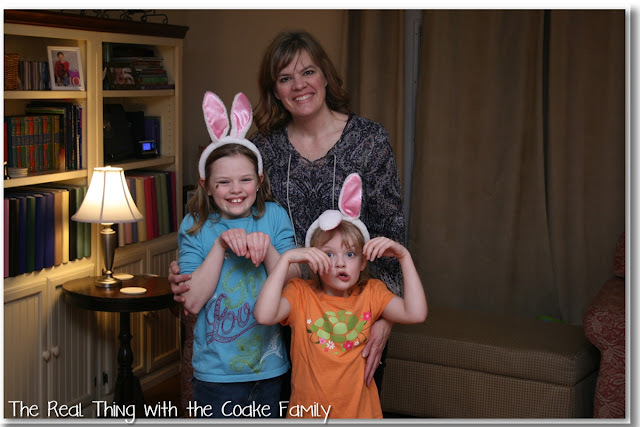 Wishing you some hippity hoppity Easter family fun! What an adorable game. Looks like everyone had a blast! Mommy did hop, but Mommy takes better pictures than Daddy, so Mommy didn’t get shown in the action! Love you, Dad! How CUTE are you?! I loved looking at the pictures of your family, I can tell you are a fun mom! What a fun idea! Great memories! Thanks! Thanks for the great link party! So adorable! I love how you always have action shots showing how much fun everyone is having! Thanks, Cheryl! The kids get a little tired of my trying to get the action shots, but I think they are fun, so I work to get them. It is nice to know others like them, too. Oh this looks like so much fun and is so cute! 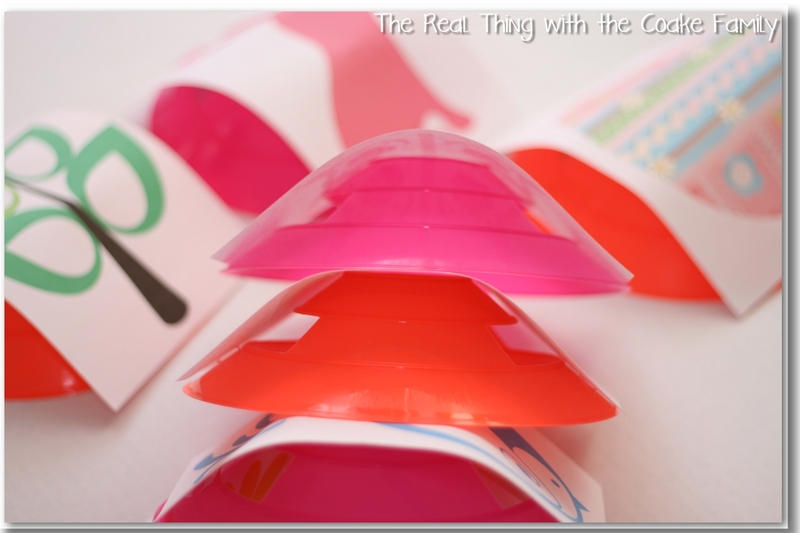 Thanks so much for linking up to Crafty Tuesday this week. I’ll be featuring this in my party highlights! Thanks, Marie! Thanks so much for the feature. I appreciate it.